We’ve all been told we should wear sunscreen in the summer sun, but too few of us actually do. And even when we do manage to smear some on, we tend to put on much less than we should. Research by the National Cancer Institute has shown that although 70 percent of adults try to guard themselves from the sun—cue the wide-brimmed hats and shady picnic spots—only about one-third of adults slather on sunscreen regularly. And in a two-year health survey, researchers from the University of Michigan and American Cancer Society found that 63 percent of African-Americans never used sunscreen, though darker skin tones aren’t immune to skin cancer. “People have all kinds of excuses—sunscreen is greasy or they forget or they don’t want to buy it. But there’s an epidemic of skin cancer in our country,” says Sherrif Ibrahim, MD, assistant professor of dermatology at the University of Rochester’s Wilmot Cancer Center. And when you pit the annoyance of remembering one. more. thing. against the reality of skin cancer, well, hand us your to-do list, because we’re going to scrawl “sunscreen” right at the top. Everyone over the age of six months—and we do mean everyone. If you have darker skin, your skin contains more melatonin, making you slightly less susceptible to UV damage. But you can still develop skin cancer. In fact, a recent study in the Journal of the American Academy of Dermatology found that while the incidence of melanoma is higher in the Caucasian population, it tends to be more deadly in people of color. Newborns and infants under 6 months old need sun protection too, of course, but the FDA recommends against using sunscreen because babies are more vulnerable to the chemicals absorbed from sunscreen, which might trigger a rash or contact dermatitis. Instead, rely on loose layers, hats, and shades for sun coverage, and keep them out of the sun as much as possible. In general, kids older than six months and people with sensitive skin tend to find physical sunscreens less irritating, says Larisa Geskin, MD, associate professor of dermatology at Columbia University Medical Center. Also look for labels like “for babies” or “child-friendly,” which signal the sunscreen is free of perfumes or dyes. No matter which type you try, make sure the bottle says “broad-spectrum,” which means the sunscreen protects against both UVA and UVB rays. Only UVA rays cause sunburn—but both can increase your risk for skin cancer. Also scrutinize the sunscreen’s SPF. The American Academy of Dermatology recommends an SFP of at least 30, which blocks 97 percent of UVB rays, compared to just 93 percent with SPF 15. That might seem like a slim difference “because people tend to look at the bulk protection,” says Dr. Geskin. Instead, flip the focus to how vulnerable your skin is, she suggests: 7 percent is double the danger of 3 percent. If you wait till you get to the beach or pool to protect your skin, you’ve already waited too long. “Chemical sunscreens should be applied about 20 minutes before sun exposure, because your skin needs time to absorb it,” says Dr. Ibrahim. You’re getting sun exposure as soon as you step outside—so your skin should be covered before you walk out the door. You also need to reapply protection at least every two hours—more often if you’re spending most of your time in the water or if you are really sweaty, says Dr. Geskin. (Go ahead and set an alarm on your phone to make sure you remember!) While no sunscreen is waterproof, those that claim to be “very water resistant” will stay effective the longest, about 80 minutes of splashing in the pool, according to FDA regulations. Which is nice, but make a habit of reapplying sunscreen after a dip anyway. The only thing worse than not using sunscreen is not using enough of it, notes Dr. Ibrahim, because then people think they’re protected and will linger longer in the sun. “If you don't apply it at the intended concentration, then it's not really SPF 30, it's more like an SPF of 3.” How much is enough? You want to use one ounce (about the amount that would fill a shot glass) on your entire body, and a nickel’s worth of that on your face. Bigger adults might need slightly more, and people without hair, or even those who style their hair with a part, should remember to apply it to the top of their heads as well. Don’t forget those often-overlooked body parts, either, like your feet, ears, and around your eyes. “Most sunscreen bottles are maybe six or eight ounces, so imagine you're putting it on eight times,” suggests Dr. Ibrahim. If that bottle is still going strong at your tenth trip to the beach, that’s a clear sign that you’re not using enough. If you skimp on sunscreen because you hate rubbing it in, you’ve got more options than ever, points out Dr. Geskin, including liquids, aerosol sprays, and roll-on sticks. That’s particularly good news for parents, who might struggle to get wiggly, impatient kids the protection they need. 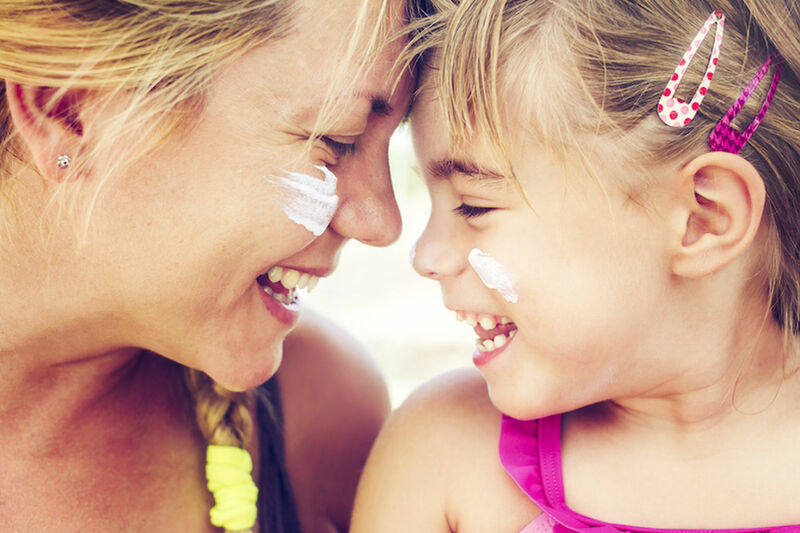 Sunscreen may be a powerful protector, but it shouldn’t be your only one. Make wide-brimmed hats, sunglasses, and limb-covering clothing part of your regular routine, and you’ll shield your skin even better. Now you’re ready for fun in the sun—minus the regret! “Prevent Skin Cancer,” The American Academy of Dermatology. “Sunscreen and Sun Protection,” The Food and Drug Adminstration, last updated Novemebr, 22, 2016. Robert Siegle, M.D., “Ask the Expert: Are Sunscreens Safe?,” The Skin Cancer Foundation, November 15, 2011.